What makes a SpiritQuest Retreats in Sedona, AZ Shamanic Retreat so powerful is that it’s all about you! This retreat with SpiritQuest Retreats is like a birthing process to rebirth the Self. You will explore a place of rejuvenation where you learn to connect with your guides, ask questions, listen for information and gain awareness at many levels. This process is a powerful vehicle to the ultimate knowing of Self, which is a priceless gift for your life purpose. With one-on-one attention from our hand-picked practitioners, you’ll experience a nurturing safe place to to re-connect with who you are. If you need to shift the energy and let go of the past so you can start moving forward again, a customized shamanic retreat is the best choice to find the true self and gain happiness and peace once again. As you read the Shamanic Retreat sample itinerary below please keep in mind that we can customize a healing retreat lasting anywhere from 2 to 14 days depending on your specific goals. The itinerary below represents just one possibility. Our promise is to construct a personal shamanic retreat package that addresses all aspects of being; physical, mental, emotional and spiritual. You can expect 4-6 hours per day in a private setting with our expert team of spiritual healers and shamanic guides. This is a highly intensive and personal experience resulting in self-discovery and personal growth. Arrive in Sedona, AZ – Check into your accommodations and relax. This first evening is a good opportunity to spend some time outdoors by yourself in silence and meditation. Cord Cutting & Ho O Pono Pono – This session requires that you open your heart and forgive. When you forgive, you become free. You are energetically connected to every person who’s ever been significant in your life. Often those cords become painful and create negative energy. This session relates to the Hawaiian technique of Ho O Pono Pono, you can gently sever those cords, sending the person’s energy back to them and taking yours back into yourself. Then, if appropriate (if you choose to continue a relationship with that person), the cords will reform on a fresh and (with your proper intention) more positive basis. Your relationship with another person must be empowering to both of you for it to be healthy. Through the power of letting go and forgiving you can go on with your life feeling whole and complete. Breaking Old Belief Patterns – In this session you’ll learn how belief systems are the “instructions” you have in your subconscious. These instructions determine almost all aspects of your life, similar to the way computer software determines what a computer will do. Many of these beliefs were formed early in childhood and have not been updated to a healthy adult viewpoint, which can be the root cause of numerous problems. By looking at the patterns in your life, the practitioner will help you learn to recognize your unconscious belief systems and how they are actually affecting you. Once the belief is found it can be updated, at which point it loses its power over you. This is an awareness session and draws from various yoga and meditation traditions. 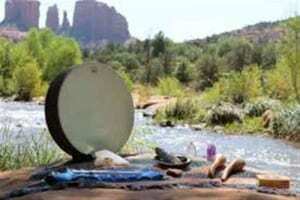 Drum Ceremony – Awaken your ancestral memories through drumming and ceremony. This session takes place out in the Red Rocks of Sedona where you will feel grounded and connected to the Earth! Listen to the powerful vibration of the drum as it replicates the heartbeat of Mother Earth, and carries your prayer into the Spirit world. Medicine Wheel Teachings – Walking Meditation – A Medicine Wheel is a physical creation of stones on the ground with pointer stones in each direction. It helps us with our “Vision,” to see exactly where we are and in which areas we need develop to realize our full potential. Your guide will help you discover where you are in your lives and which areas need to shift. Meet Your Guides & Connect with Inner Wisdom – Are you searching for wisdom and insight about your life and have had enough of the psychics? Psychics are great for the beginning stages of your spirituality. They serve as a reminder of the power we all possess. Perhaps, you’ve reached a point where you already know and/or feel information being revealed to you, confirming your own intuitive ability. If so, then this session is for you! You will meet your spiritual guides and learn to make decisions from that sacred place. This is nothing more than learning to be truly present and learning to listen and trust. Shamanic Retreat Soul Recovery – “Soul Pieces” are aspects of yourself that became fragmented due to trauma or emotional upheaval. When the psyche perceives an event as too overwhelming and the “Chitta” takes over, it seeks to protect you by separating a part of itself from your main energy system. The fragmented part then holds the full emotional impact of the event so that your psyche can continue to function intact. The price for this protection however is often a loss of spirit, which manifests as being ‘shut down’ or ‘lost’ in some area of your life. In a Soul Recovery session, the lost part is retrieved and returned to you so that you can become whole again. Breathwork: Letting Go – This is a safe and simple way to trigger experiences of non-ordinary consciousness that open you to a greater spiritual understanding. Lost memories from your personal history, experiences from your birth, and archetypal and cosmic phenomena can become available to you through awareness, helping you transcend the constraints of your ordinary thoughts and habits. This session draws from various breathwork traditions and helps you realize that it’s all illusion and freedom comes from allowing an emptying of all that has kept you bound. This session is about getting out of your head and releasing the pain you’ve been carrying. Way Of The Peaceful Warrior – It’s time to explore the laws of proper relationship, which necessarily involve reciprocity and mutual respect in order to be healthy. These laws apply to everyone, whether we’re conscious of them or not. You’ll learn how to create harmony and balance in your life by cultivating gentleness and gratitude in combination with a willingness to sacrifice oneself for the greater good — which is the essence of what it means to be a warrior. Shamanic Wisdom Journey – Remembering the intent of your SpiritQuest journey… it’s time to reconnect with Mother Nature and claim your power! Discover the Shamanic pathway to break through old limitations and unveil the ecstatic beauty and wisdom of who you really are. During this powerful session, conscious, connected breathing and drumming is used to clear limiting beliefs which inhibit the free flow of pleasure, ease and grace. Meditation is used to deepen your direct connection to and respect for the innate body wisdom and awaken and activate every cell in the body, leaving you more alive than ever before! Canyon Journey – Take off with your own spiritual guide into the Sacred Canyons of Sedona, and discover the quiet place inside yourself. Let your connection with yourself and nature allow for a huge release. Be led by your totem guides to find clarity and peace of mind. Learn to let go and to be in the present moment. This will be a day unlike any other you have ever experienced. Spiritual Awakening – Spiritual Awakening deals with deepening your connection with God/Source/Spirit and working with you at your Soul level, asking the questions and exploring why did you come here? What are your lessons, challenges? What is your purpose? Get in touch with you at your center, the Source of who you are, using principles of meditation, connection, and the power of being present. Mind, Body, Spirit Integration – This may be the end of your retreat, but it’s just the beginning of the changes you came here to make. Now you will bring closure to your quest and pull in the loose ends. You have discovered how to use your own inner power to create a more joyous, abundant and healthy life… the life you truly desire. You will feel a circle of wholeness and a renewal of Spirit. You are revived and ready for new beginnings. Depart Sedona – You will depart Sedona with a new perspective and sense of connecting to your spiritual being and gaining self-worthiness and understanding self-purpose after your Shamanic Retreat. You are now the creator of each new day and you will take home tools from your journey to help you gain a sense a deeper understanding of love. If you need us when you return home take advantage of our phone counseling and life coaching! Are you ready to grow into self-awareness?